Some people have no problem speaking publicly. They can get up in front of a group of people, large or small, with confidence, without breaking a sweat; their hands do not shake; their face will not flush; they do not so much as stutter. If you are one of these people who can confidently breeze through any kind of presentation, performance, recitation, or speech, then this essay is not for you. I am not one of those people and can only write about what I know: fear, humiliation, and crippling anxiety. Opportunity. Your teacher or professor has assigned a presentation. It could be anything from a personal narrative, an informative speech, a persuasive speech, to a PowerPoint presentation. Regardless of what your assignment is, you must stand up in front of a group of people, and that is terrifying. For me, it started in senior English. One innocent afternoon when I thought the world was working in my favor, I walked into class to hear my teacher assign a poem recitation. This was a class I did not so much as whisper in. I could not speak in this class without fear ripping any tiny amount confidence I had to shreds. Now, I was being asked to stand up, all eyes on me, and recite poetry? With no dramatics, I believed this to be the worst news I had ever received; this assignment would be the end of me. If you have had this “opportunity” in your life, then you know what I am talking about. Denial. The “opportunity” has now forcibly made its way into your life and you will create any excuse possible not to participate in this assignment. There may be many absences involved. You might even flat out tell your teacher you are not doing it–that you cannot do it. The word “cannot” will not benefit you and will only get you into trouble. It is important to understand in the early stages of the public speaking journey that you are not unable. If you can walk, talk, crawl, or mumble, you are in fact able. Questioning your ability will only set you up for failure. Now, with all that said, you will still attempt to tell your teacher or professor that you cannot do it. You might say it through stifled tears, avoiding eye contact. You might be wearing the saddest puppy dogface this world has ever seen, but I am telling you with 100% certainty that they will respond with, “Yes you can.” This will feel like a punch in the gut. You will leave feeling defeated and misunderstood with no compassion or sympathy within miles of you, that the world is out to get you and nobody seems to care. Push aside all feelings of self-pity. I understand being nervous and I understand fear, but you will not move forward until you give up this idea that you are unable to do something. Remove the word “cannot” from your vocabulary, immediately. Acceptance. Sometime after your somewhat emotional breakdown, you will realize the assignment is necessary, you will not be taking a zero, and you must go through with it. I would like to tell you that your nerves will soon settle, but that would make me a liar. The fear you were experiencing when you first heard of the assignment is most likely the same, if not worse. This time there is no avoiding involved. Instead, day-by-day your anxiety will build. The only way it will stop is when you say that last word in front of your class and step down from the humiliation. You might as well take your coat off and stay a while because you have a ways to go. Thoughtful decision–making. Before you can begin the actual presentation process, you must have the written piece you plan to present. Whether it is a speech or poem, your specific assignment might require it to be a personal piece you have written or plan to write. For my poem recitation, I had to choose from a variety of poems written by others. Regardless, if it is your writing or someone else’s, the subject you choose to go with must be something you are passionate about. You cannot expect to speak about just anything in a monotone voice with no feelings toward the subject at all; if you do not enjoy it, neither will your audience. What you say has to mean something to you, make you feel something, so in turn you can make your audience feel something. Anybody can say an assortment of words in front of a group of people and consider it public speaking; however, it is not public speaking done well. Memorization. It is not only important if it is required for your assignment, but memorization helps calm your nerves. Do not focus on how you present until you understand and have memorized what you are presenting. You may or may not have a paper template with you for your presentation. If you are presenting a speech, of course you will have it in front of you for your presentation. This does not mean you should not have almost every word memorized. You should have read through it enough times that each sentence comes out with ease and flows so you can make eye contact with your audience rather than looking down at a piece of paper reading word for word. You will only have it with you as a guide. Your assignment may also require complete memorization, with no paper template, for example, a poem recitation. Do not become overwhelmed by this. Memorize line by line. Read each line repeatedly. When you have it down, add the next line, and recite them together. Repeat for each paragraph or stanza until you no longer have to read; you can just recite. From the moment you know what you are reciting until you step up on stage, you should be, either aloud or in your head, reciting every chance you get. Knowing that you have every single word memorized can take away the anxiety of forgetting a line while you are presenting. Expression. When it comes to what and how, sometimes the how can be more important than the what. This is where the present in presentation comes in; it is how you express, articulate, and gesture. When speaking publicly, your hand gestures, your articulation of words, and your expressions not only help your audience understand what you are talking about but also make them feel what it is you are talking about. Get rid of this preconceived idea that judgment will follow your expression. This is how good public speakers get their message across. The reality is that those who do not care, will not remember your presentation even an hour later, and those who do care, will remember the positive influence it had on them and how you made them feel. Twenty years from now, people are not going to be ranting about how much they disliked your presentation and how they still experience second-hand embarrassment. Once you stop flattering yourself with the fear that people care that much about what you do and how you do it, you ease the fear of judgment. You will be practicing a lot in front of the mirror. You might even have to research certain things to understand fully the meaning, so you can present it with confidence. Good presentations do not come easy; they take time. Final Product. The day is here. You are up on stage with the lights beating down on you. You might be sweating; you are probably shaking; and you still are not sure if you can do this. I would suggest you just go through with it because running off stage will cause you far more humiliation than a couple of stuttered paragraphs. You might become so overwhelmed that right smack in the middle you forget the next line. Do not sigh. Do not roll your eyes. Do not make an awkward comment followed by an awkward laugh. Pause. Your mouth is working faster than your brain can form coherent thoughts; you know this inside and out. Continue. Nobody noticed; it was just a dramatic pause. Also, talk slower. Look out at the audience. Notice people nodding, closing their eyes with their heads raised, soaking in every word. Right at the end of my poem recitation I noticed one of the judges reciting the poem with me, nodding, absorbing the meaning. Look for those people; the reassurance will calm you. When you are done, take a deep breath. It is over; you did it. Your first mistake on this journey was seeing public speaking as a dreaded task instead of an opportunity. Any chance given to you to face a fear is not one you want to give up. After my poem recitation, I ended up going to the school wide competition. I placed second. For the first time in my life, I could see my fears sprawled out on the road ahead of me, and excelled despite it. 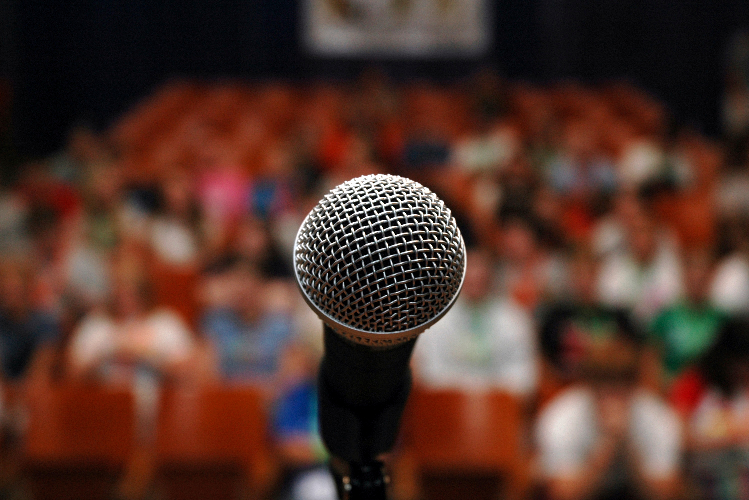 You do not have to perfect the art of public speaking. You do not have to become a professional public speaker. You do not even have to overcome the fear. Just be afraid, and do it anyway. Mirade is a current student and rising star. Her process analysis essay about public speaking shared such great advice about life in general, that I had to share it on my blog (with her permission, of course). I hope you enjoy it as much as I did. If you are fearful about anything, follow Mirade’s advice: Be afraid, and do it anyway. This entry was posted in A New Start, Guest Blogger, Pauline's Soap Box, The Beauty Around Us and tagged Fear, Public Speaking, Students, Teaching, Writing. Bookmark the permalink.